"Sing Your Life" is a single by Morrissey released in April 1991. It was the second single taken from the Kill Uncle album. 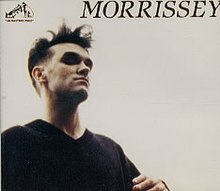 On release this was Morrissey's lowest charting single in the UK charts, reaching only number 33. One of the single's B-sides was a cover version of "That's Entertainment" by The Jam which had backing vocals by "Chas Smash", a.k.a. Carl Smyth the second singer of the band Madness. Vic Reeves also recorded backing vocals for the song, but they weren't included in the final version. He is thanked in the sleeve notes. (1991) "Pregnant for the Last Time"
Stuart Maconie in NME gave the single a positive review, calling it "toe-tapping". Ned Raggett of AllMusic called the song "one of Morrissey's subtler pieces, and also one with a more upbeat and straightforward message than most." The song was performed live by Morrissey on his 1991 Kill Uncle tour. The song was last performed on 6 October 1991, and was dropped from the set list for the rest of the tour. Along with all of the material from Kill Uncle, "Sing Your Life" has never been performed by Morrissey since the 1991 tour, but it is frequently requested by his audience. When Morrissey hears the request, he usually replies by saying "I'm singing it." ^ a b Raggett, Ned. "Sing Your Life Review". AllMusic. Retrieved October 18, 2012. ^ Maconie, Stuart (6 April 1991). "Why does this man want to be a popstar?". NME: 50. ^ Goddard, Simon (2009). Mozipedia: The Encyclopaedia of Morrissey and the Smiths. Ebury Publishing. pp. 347–8. ^ Morrissey, Sing Your Life credits (CD sleeve notes). A and Son Music Ltd. 1990. ^ "Morrissey live history: Kill Uncle tour". www.passionsjustlikemine.com. Retrieved 14 April 2017.